For Logan Airport (Boston (BOS)) arrivals: The driver will be standing outside of the vehicle at the designated pick-up area, holding a sign with the customer’s name on it. For T.F. Green (Providence (PVD)) arrivals: The driver will be waiting in the parking lot directly across from center of terminal on the LOWER LEVEL. 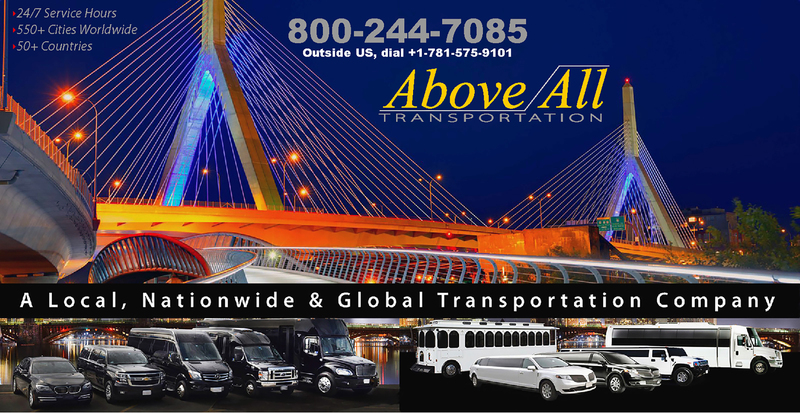 If Above All Transportation dispatches a vehicle and we cannot find the client, Above All will do its utmost to find the passenger. If we are unsuccessful, we will bill the account for the full amount of the trip. Waiting time is billed at 15-minute intervals on top of the total trip charge. Package rates are identical to regular passenger rates. Any trip scheduled between 12:00 AM – 5:00 AM will be billed an additional $20.00. When passengers arrange to make extra stops on the way to the destination, a $20.00 charge will be charged for each stop. A recommended 20% gratuity will automatically be added to the total trip charge for all vehicles for your convenience. The payment of this recommended gratuity is subject to your complete discretion and may be increased, decreased or eliminated entirely. Any gratuity will be remitted in full to the chauffeur. Additional charges may apply etc… tolls, fuel service… prices subject to change any time without prior notice. ©2017 Above All Transportation, LLC. All rights reserved. No part of this website may be reproduced, reposted or redistributed by any means, electronic or otherwise, without the express, written permission of Above All Transportation or the owner of any copyrighted content contained herein. Content not owned by Above All Transportation is used with the permission of the copyright holder.